Can you believe that it’s finally raining here in Southern California? What a perfect time to just drink some hot chocolate and get all cozy! Well, last Friday I was able to do just that! My friends and I needed to get out of town and relax somewhere far, far away. We got a cabin through a convenient site called Air BnB. This cabin was so cute and cozy. We easily felt right at home. It had Netflix, all the appliances for cooking, and it was located close enough to the market and the slopes. When we got there, Linda started making dinner for us. She made us some awesome homemade kalguksu (kahl-gook-sooh) aka knife noodles in literal Korean translation. So she made the noodles herself and added some chicken broth with some chicken and onions. After eating, we went night tubing which was the main highlight of the trip! We each paid $20 for unlimited night tubing at Alpine Slide. It was about 20 minutes away from our cabin which wasn’t too bad. I’m glad we went to this place because they had flat escalators to take you to the top of the slope. After many rounds of going down, you actually get pretty tired surprisingly. So thank you Alpine Slide for having that flat escalator! Oh man, I can’t get enough of that video. It’s just so hilarious to watch and it makes me want to go back now! I hope we can go back soon! Later that night, we went to the market to pick up some late night snacks and relaxed in the cabin. We had some pizza as we were watching some movie thanks to Netflix! Also had some hot chocolate! Thanks Linda for making us the hot chocolate! It was one long night with these lovely ladies and I enjoyed every moment of it with them! Special thanks to Linda for driving and making us some YUMMY food! Christian recently got back from the east coast so it was time for me, Briana, Mark and Christian to reunite. Unfortunately, Briana wasn’t able to join us due to prior engagement. Whenever the four of us hang out though, we like to experience new places or go to our traditional spots. Somehow for this recent hangout, we weren’t able to figure out where to go. Christian thought about Orange County but I felt that I’ve conquered OC to the point where I haven’t found anything newly exciting just yet. So I suggested LA since there’s always something to do there. We decided to go to a traditional spot, The Grove. Before Christian moved to the east coast, The Grove was actually the last time we all hung out. 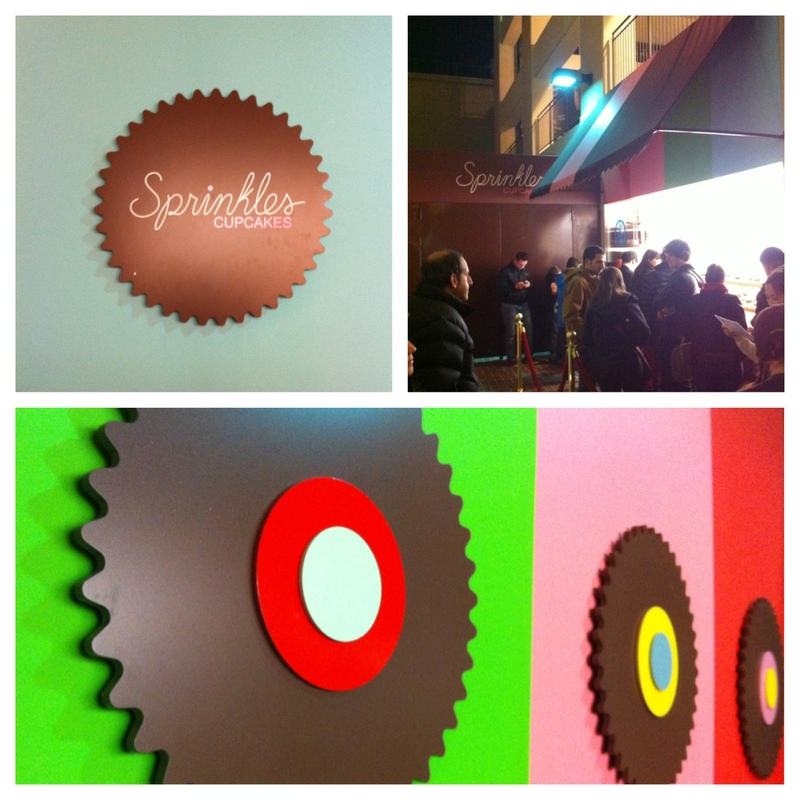 Something new we found at The Grove was Sprinkles! Right by the parking structure is a quick mini Sprinkles stop. You stand in line outside and order right at the window! It was pretty convenient to have it right there by the structure just so that everyone is bound to see the little cupcake shop. FYI. Follow Sprinkles on Twitter! They have special secret word of the day on Twitter. If you say the word at Sprinkles, they’ll give you a free cupcake! There’s a catch to it, of course. It’s only if the first 25-50 people say it. Be on the look out! It’s always a magical night at The Grove. They still had the holiday decorations up, Christmas music playing, and snow too! Ok, it was more like bubbles rather than snow. But still. It was fun walking around in holiday spirit even after Christmas. 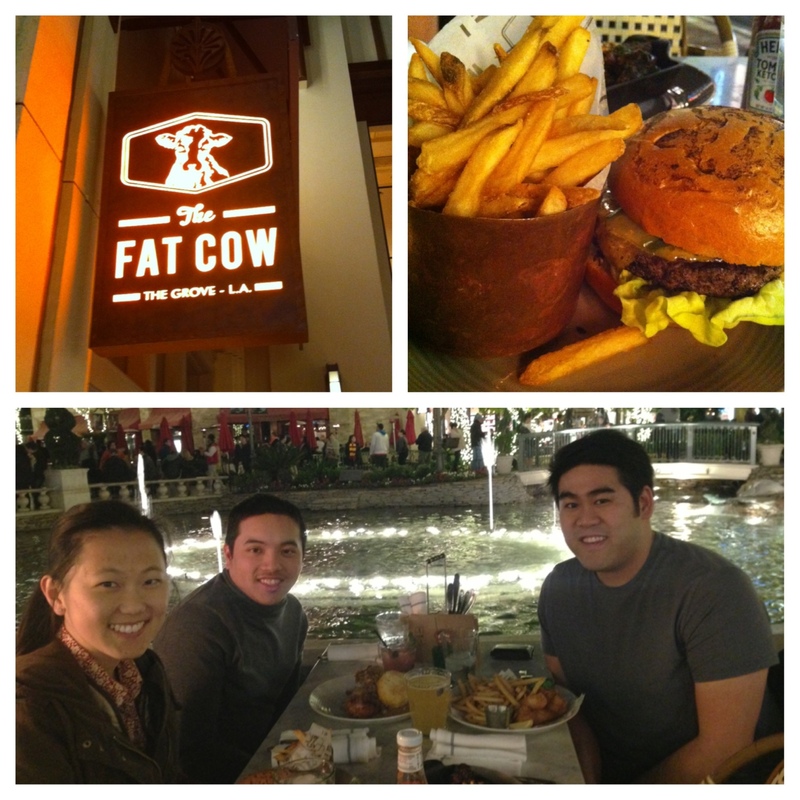 After shopping around, we came to a conclusion at 9PM to eat at The Fat Cow which is owned by Chef Gordon Ramsay. We sat out in the cold just so we could have a nice view of the fountain and look cool. Just kidding about looking cool. But we did sit outside in the cold. Luckily, I was sitting by the heated lamp. The food was a-ok. It’s not a place where I have to go back to. I’m a simple person so I just ordered a Fat Cow Cheeseburger. Nothing special about it. A little dry but it’s because I got it well done. Food was overly priced for its quality. We each probably spent about $17-$25 on our meal. I wouldn’t suggest anyone going there unless you have the time and money. It’s just overly priced because you’re at The Grove and the restaurant is owned by a famous chef. We probably should have Yelped before going there but we wanted to try a new spot. According to Yelp, The Fat Cow got 3 out of 5 stars with 194 reviews. I’m not surprised with its 3 stars. The restaurant actually reminds me of Umami Burger with its stamp on the buns and its overly priced burgers. After trying a new burger place like The Fat Cow, I always come to a conclusion that nothing ever, EVER, beats In-N-Out. I’m glad the three of us were able to hang out! It was good catching up with you both! Briana, wish you were there but it’s ok, you saved $20 for food.